Dr. Mai Phan Hoang Yen completed and gained the General doctorate degree in 2008 with the outstanding result. Plus Postgraduate certificate in Ophthalmology trained by Hue University of Medicine in 2009. Additionally, Dr. Hoang Yen attained Anterior Segment Laser certificate in 2000. 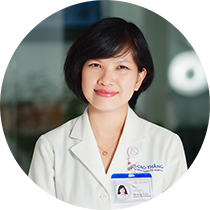 Dr. Hoang Yen served as an Ophthalmologist in the Ophthalmology Clinic Division in Thanh Mau Ho Chi Minh City-Based Hospital during the year 2011 and 2012. Since 2012 up to present, Dr. Hoang Yen has been working at the Glaucoma subspecialty in Cao Thang Eye Hospital (CTEH). Dr. Hoang Yen is responsible for diagnosing and treating the Glaucoma diseases & consultations of the refractive errors. Furthermore, Dr. Hoang Yen completed the training and obtained a certificate of GP Specialists Corneal Refractive Therapy Orthokeratology Lenses called“ Ortho-K” in 2017.